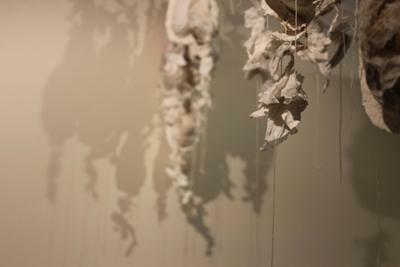 A suspended installation of more than 120 sculptural pieces is just one of the feature works in an up-coming exhibition from local artist, Rose Rigley. The exhibition, NEST, a series of sculptural works, will be on display at c1907 Contemporary Artspace in the heart of the CBD from 12th June. As a founding member and curator with local artist-run initiative, Knock Knock, Rose Rigley is active within the Cairns arts community. ‘NEST’ is an experimental series of works, marking her first exhibition as a solo artist. The gallery will host an official opening on Friday 15th of June from 6pm, with an artist’s talk, an address by guest speaker and prominent local artist, Jennifer Valmadre and music by local singer / songwriter Alex Blagojevic.